I enjoyed writing the Etsy Picks post so much that I have a few more in the works. A friend on twitter requested I post some things that would be appropriate for boys around 3 years of age, and this is turning into a post with some of the best toy finds on etsy. Then I’m doing a round up of stocking stuffer ideas because it seems like those can be the hardest. Finding inexpensive gifts isn’t necessarily hard, but finding inexpensive gifts that will be used and enjoyed and appreciated (and not tossed in a junk drawer later) is a whole different game. Finally, I’ve been working on a collection of picks for some of the hardest people to find etsy gifts for: men. Men can be hard enough to shop for anyway, but finding stuff on etsy for them can be a challenge. Especially once you start looking for stocking stuffer gifts. Maybe it’s just me, but my husband is not the easiest person to please, and if you have a friend or a boyfriend to shop for, then you’re also skating that line of finding something they’d like that’s not too serious or intense, yet at the same time, is something they’d love and love you for. It’s entirely possible I’m reading too far into gift-giving at this point, but I figure if you’re coming here to read this then either a. you enjoy my neurosis, or b. you share it. Either way, welcome to the nut house. 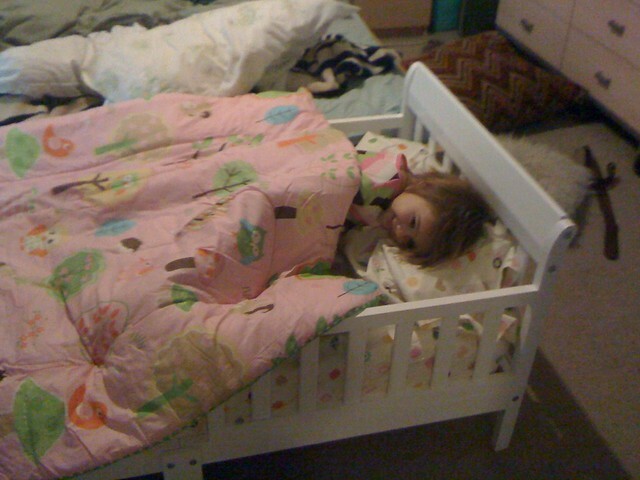 Yesterday, while I was groaning from the weight of a migraine that took all day and three Imitrex pills to conquer, Anthony and I set up Isobel’s Big Girl Bed. No, we’re not using this bed yet. It’s too tall to be safe and we don’t have a mattress for it yet. 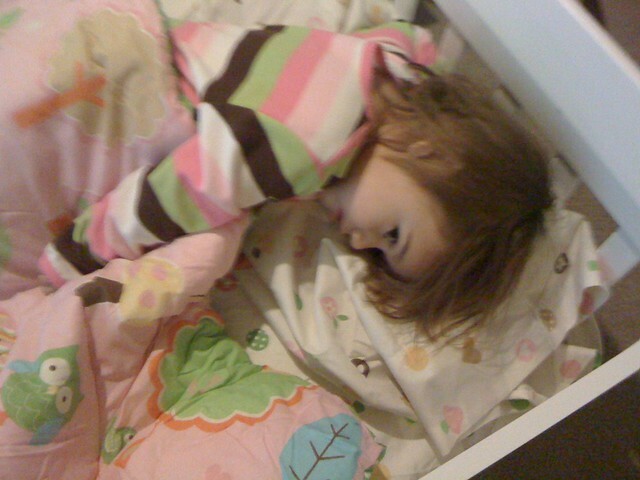 We’re using an actual toddler bed my in-laws bought as an early Christmas present. It was delivered a few days ago but yesterday was the first day Anthony felt well enough to set it up. We were both nervous about making the transition. Isobel cosleeps with us. There are a lot of opinions out there about cosleeping, and let me tell you, I heartily care about none of them. Someday I will probably write a post about our experience with it and what it has meant to me, but not now. Maybe you cosleep. Maybe you’d never dream of it. It’s one of those Hot Button Parenting Topics that everyone has their own opinion about. Honestly, the only reason I’d ever want to write about cosleeping is to help someone who feels the same way as I do examine their feelings about it. I would never want to persuade someone one way or the other because parenting is not a “one size fits all” method, and the last thing I’m here to do is to tell someone they’re doing it wrong. So. 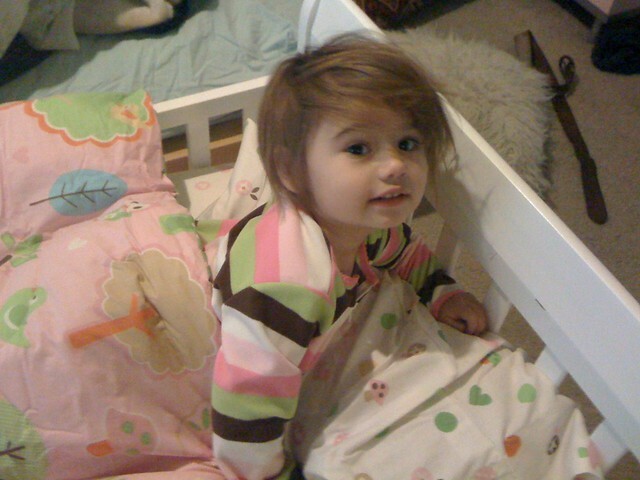 Our challenge was to get Isobel out of our bed and into her own. And we were nervous about this because Sweet Holy Picard Baby Jesus, I loves my sleep. Our first day & night (we had her nap there) of Big Girl Bed Sleeping went well, and I’m happy to report there’s nothing to report. I’ll post some better photos of the bed soon, these were just the ones I took with my phone to send to the Grandparents. Oh, and in the tradition of Sunday Home Movies, here’s a Thanksgiving video we took of Isobel and my in-laws rocking out to Life Goes On by the Beatles. Good to know you’re raising her right on the Beatles.